Storage of moist cereals for animal feed is quite common in temperate climatic regions. Usually to achieve this, cereals are kept sealed to allow a build up of CO2 to inhibitory concentrations with very low O2 concentrations. Sometimes, improper sealing enables spoilage to proceed rapidly, especially by microaerophilic species such as P. roqueforti, P. carneum, and P. paneum. This results in poor quality animal feed with potential contamination with mycotoxins (Petersson and Schnurer 1998). Recent studies in Sweden have approached this problem by the use of antagonistic and competitive yeasts such as Pichia anomala which can be inoculated onto wheat, barley, or oats prior to storage. This yeast effectively colonizes the stored cereal and prevents spoilage molds from causing deterioration in feed grain quality. P. anomola has been found to be effective at controlling growth of P. roqueforti in moist cereals (Petersson and Schnurer 1998). 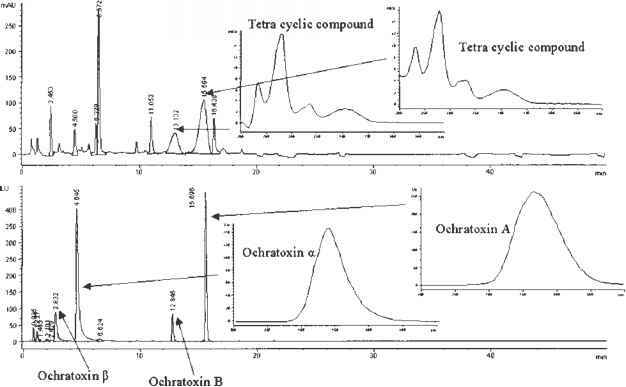 Recent studies indicate that antagonistic yeasts such as P. anomala may also affect ochratoxin A accumulation by P. verrucosum, and other important toxigenic species in cool temperate climates (Petersson et al. 1998). This approach has not been examined for moist tropical cereals destined for animal feed where often spoilage fungi can invade preharvest and thus make postharvest control more difficult. This could, however, be a promising area for future commercialization of natural inoculant treatments, especially for animal feedstuffs free of mycotoxin contamination.